The Industrial Division provides fibreglass services to the most demanding applications found in industry. From small to large volume tanks, piping and ducting and custom products found in today's manufacturing and service industries. 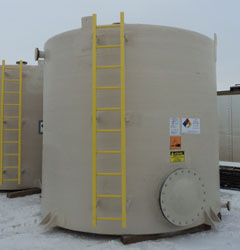 We can provide our customers with unsurpassed quality in chemical containment technology. Laminates to the customer's requirements are used along with the stringent quality control methods and engineering for which Carlson's has become known. Filament wound products, including tanks, piping, ducting etc. Carlson can provide experienced, trained crews to install and service any of our product lines. For all of your industrial fibreglass needs, contact the one manufacturer that can provide all the services and support you will require!